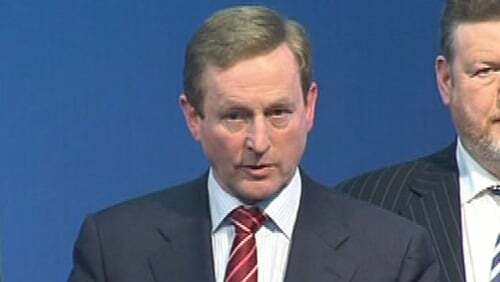 Fine Gael leader Enda Kenny has said he will not participate in any programme that TV3 broadcaster Vincent Browne has anything to do with. Mr Kenny criticised Mr Browne over comments he had made in regard to suicide, but said this would have no impact on his relationship with TV3, or other proposals it may wish to make. Canvassing in Roscrea, Co Tipperary, this afternoon, Mr Kenny said he hoped the issue of a Leaders’ Debate will be ‘finalised’ by this evening. His officials are currently in discussions with the broadcasters in regard to the debate, including his proposal for a debate including all five main party leaders. Mr Kenny's remarks came after a complaint about the comments made by Mr Browne in relation to suicide has not been upheld by the Broadcasting Authority of Ireland. Rachel Wright, speaking on behalf of the group Headline, had said comments made by Vincent Browne were insensitive and likely to cause harm and distress. In response TV3 said the comment was made in a flippant and glib manner, however it understood the comment could have been viewed as offensive. The station said Mr Browne offered a full and unreserved apology to viewers for any distress caused and wrote personally to Mr Kenny to express regret. The compliance committee of the BAI said the swift action taken by the broadcaster sufficiently remedied the matter and that the complaint was resolved.